This page gives a month by month summary of how the project unfolded. It is now complete, although we are still working on some new analyses and publications. The project ended this month. We made changes to our Handbook based on feedback from the stakeholder event. We decided to create a website (see above! ), and completed all the formalities for ending the project with our funder, the Australian Research Council. Nick has been back in Tasmania, re-visiting the three Child and Family Centres that were involved in the study. A draft report specifically on the Tasmanian data has been circulated for feedback from Centre Leaders and their community. On 16th November, the main Creating Better Futures project stakeholder event was held in Sydney, attended by representatives of services and parents from NSW, VIC, SA and TAS. On 7th November, Nick was interviewed on ABC Radio Hobart’s Breakfast show, to discuss findings about Tasmania’s Child and Family Centres. Nick presented key findings to the Karitane Trends and Challenges of the 21st Century Child conference, which was held at the International Convention Centre in Sydney. The presentation covered some of the essential ingredients of impactful partnership, describing how this requires working at the frontier. Key points from the talk were featured in the conference highlights produced by Karitane. A chapter based on one of the papers from the ISCAR Congress in Quebec has been submitted to the volume editors Anne Edwards and Mariane Hedegaard; this is scheduled for publication later in 2018. This month we focused on completing our analysis, and drafting a Practice Handbook – one of the main impact and dissemination mechanisms from the study. A key outcome this month was the delivery of three presentations at the International Society for Cultural-historical and Activity Research Congress 2017 in Quebec. One paper was on double stimulation as a means to help parents escape conflicted situations where motives of love and care for children pull them in opposite directions. Another examined how relational agency, relational expertise and common knowledge are required in mind-expanding partnership work with families. The third looked at how professionals can help to build common knowledge (mutual understanding of what matters to others) between parents and children. Analysis continues, and we have had another paper accepted. This one relates to phase 2 data, and presents an expanded – and now thoroughly empirically tested – framework for understanding how nurses support parents’ learning. It highlights pathways through which professional expertise can be brought to bear while maintaining the principles of partnership with parents. Nick also gave a seminar at the University of Sydney. Furthermore, we are delighted to have been accepted to present at the Karitane Trends and Challenges of the 21st Century Child conference in October. As fieldwork and data collection are now finished, we focused on analysis. Nick has been working on how nurses’ expertise makes what matters to children accessible to parents and available as a resource to help parents support children. Teena has been looking at the phase 3 data from NSW, Tasmania and South Australia. Landmark month! We reached 200 data collection interactions: 129 interviews (74 from Phase 3 and 54 from Phase 2) and 71 observations (52 from Phase 1 and 19 from Phase 2). This is an immense achievement, reflecting massive support from our partners, and we are hugely grateful to all the participants for trusting us and taking time to share their stories. Now we have to do justice to all the data! Fieldwork in Tasmania’s Child and Family Centre’s is now complete. Nearly 50 people were interviewed – a mix of staff, volunteers and of course, parents. We heard some amazing stories of positive transformation for families and communities. We have also been wrapping up our Sydney-based fieldwork. Another paper has now been published, based on data from this project. You can read more about it on this blog post. Nick also gave a seminar at the UTS School of Education, with many academics from the UTS: Health faculty coming along to listen. We have begun our fieldwork in Sydney, interviewing professionals, volunteers and parents involved in a range of services including supported playgroups and early intervention home visiting. Nick was quoted in a Sydney Morning Herald article about supporting parents who are struggling – giving insights based on what we’ve found in this study. The second was written with Anne Edwards from Oxford University – a world leading researcher and expert in Vygotsky / cultural-historical theory. More data collection in Tasmania! Thank you to all the staff, volunteers and parents from two child and family centres who spoke to Nick and made him feel so welome! We have also been engaging with others who work with parents – via a seminar at the Behavioural Sciences Unit of the Kids Cancer Centre at Sydney Children’s Hospital. People who attended the seminar work or do research with parents whose children are being treated for cancer, are in palliative care, or have chronic illnesses. We had a lot in common, including how professionals have to work from a ‘state of unknowing’, how they help parents escape impossible situations (where motives to care for and protect their children pull them in different directions), and on the difference between aligning with parents’ goals, and aligning with what matters to them. Data collection for Phase 3 has begun! All our fieldwork in South Australia has been completed already – 12 interviews (6 parents, 6 practitioners). And one round has already been done in Tasmania (15 interviews total), with 2 more left to go. Hopwood N & Edwards A (in press) How common knowledge is constructed and why it matters in collaboration between professionals and clients. International Journal of Educational Research. Year 3 already! The End of Year Report for 2016 (Phase 2) has been completed, and circulated to our stakeholders. We heard that abstracts relating to the study were accepted for presentation at the ISCAR conference in Quebec in August this year. ISCAR is the main worldwide organisation for researchers who work in Vygotskian learning theories, and so is a key venue for international dissemination of our findings. We are pleased to announce that the second out-of-state partner for 2017 fieldwork has been confirmed. We now have relevant Site Specific Authorisation to work in several sites within the Women’s and Children’s Health Network. We are delighted to have this valuable collaboration as part of the project. Hopwood N & Gottschalk B (in press) Double stimulation “in the wild”: Services for families with children at risk. Learning, Culture and Social Interaction. A presentation was given at the Australian Association for Research in Education conference in Melbourne. This outlined a fully tested and now expanded model that explains how professional expertise can be used to respectfully but powerfully foster parents learning and emerging agency through connected processes of noticing, attaching significance, and attributing possibility for change to parents. Teena visited the second out-of-state location for our planned fieldwork in 2017, and an application for site specific authorisation there was submitted. We will be able to name this site once the authorisation is granted. Completed the phase 2 fieldwork, exceeding our target number of interviews. We have tracked the experiences of 12 families from their contact with a range of services through to interviews several months later. This will give us a strong basis to look at the legacy of parenting education / intervention support in families. Finalised our out-of-state research sites for 2017 (NSW sites still to be confirmed). We are delighted to be working with Tasmania’s Child and Family Centres; the second site has yet to be formally authorised, so we have to keep that confidential for now. Had another paper accepted for publication, called “Using professional expertise in partnership with families: a new model of capacity-building” in the Journal of Child Health Care. This was led by Teena Clerke and co-authored by representatives from our stakeholder services. More details as soon as it is published! Presented at the Australian Association for Research in Education (AARE) Annual Conference in Melbourne. Another Newsflash! Things we’ve learned from this project have been included in a Podcast series called ‘Where Parents Fear to Tread‘ by Rebecca Huntley on Kinderling Radio (which recently won best digital radio station in Australia). In Episode 1 there’s a segment where I talk about why resilience is important, and things I’ve seen effective services doing to support parents (from about 11:45 onwards, but the whole episode is well worth a listen!). In Episode 3, I talk about parents’ decisions relating to kids’ screen time and the importance of their own self-care (from 14:30 onwards) and in Episode 4 I talk about decisions relating to children starting school (from about 7:10 onwards). Newsflash! We have reached one of our main targets for data collection in phase 2: 50 interviews. We have completed follow-up interviews with 10 families, several months after each had their last contact with the service they started with earlier this year. We still hope to complete the sequence with a few more families, so watch this space! In late October, Nick visited CRADLE (Centre for Research on Activity, Development and Learning) in Helsinki. This is one of the world-leading research hubs for studies based on Vygotskian / cultural-historical theory (which are used in the BetterFutures study). He gave a seminar – the first public airing of our analysis looking at double stimulation in parenting education. Audience members looked at some (anonymised) data extracts which provoked a lively discussion. Lots of views were aired, but there was a consensus that we had evidence of some fantastic practices to work with! More long-term follow-up interviews with parents. We are hearing some fantastic, humbling, accounts of how parenting interventions have really passed the test of time, enabling families to weather rough patches with resilience and confidence. We have also found some cases where some aspects of the intervention have faded more quickly than others, which gives us some important foci for our analyses. The transformative events analysis is progressing, looking into detail at what explains the broader patterns, identifying anomalies and asking what we can learn from them. A month of more fieldwork and more breakthroughs! We are still re-connecting with families for long-term follow-up interviews. As expected, a couple of dropped out of the study, and we are respecting their decision to do so. We planned for this, so still have good numbers of participants still involved in this longitudinal phase. The analysis has leaped forward, building on the progress from July. Nick attended a (kind of) conference in Tampere (Finland), where academics share anonymised extracts of data and discuss them together. The group recognised lots of aspects of partnership, highly skillful communication, and a strong (but not bossy!) role for professional expertise in the excerpt based on this project. This has prompted a new line of analysis considering how professionals and parents work with categories, and how taking up or challenging these categories forms an important part of achieving positive change. The analysis based on transformative events has seen another step in the process completed. We have now gone through all the relevant data, checked inter-coder agreement, and established the broader patterns. These enable us to begin asking new questions of the data in the next stage. We are delighted to announce we’ve been accepted to present at the Australian Association for Research in Education conference, where we will report the final outcomes of this work. More analysis has also been done in relation to concepts of common knowledge and double stimulation. It’s early days for this, but more than the germ for future publications has been planted, so watch this space! We have continued with the long-term follow-up interviews, and expect to have these wrapped up for by October. This month we re-connected with parents who had completed a Circle of Security – Parenting course, and those who had been involved in a community-based parenting group. We also made a breakthrough in our analysis. We have been building on the idea of ‘transformative events’ (a way in which professionals turn small things that might go un-noticed, into a resource for learning and affirmation of parents’ agency). These were first found in Nick’s previous study of Karitane’s Residential Unit. The breakthrough here has been to expand the concept, as we have found versions of such events across the data from Phase 1 and Phase 2. The analysis continues, now with the updated concept as its foundation. This now has to be plugged in to the whole dataset, checked, re-checked, modified, and checked again. We hope to present early outcomes in November/December. Phase 2 fieldwork continues, seeing us reach our target for recruiting families to follow over time. We also did the first long-term follow-up interview, several months after our first contact, in this case with a participant in an early parenting group. Two journal articles relating to phase 1 were also published this month! This month fieldwork has continued, and analysis of the Phase 2 data set has begun, with one approach combining further observations with the data from Phase 1. We are testing and further developing some of the key concepts from Phase 1 and prior research, benefiting now from data across a wide range of services. In late May Nick visited colleagues at the University of Copenhagen, finally meeting a long-term theoretical inspiration, Mariane Hedegaard. Stimulating conversations were held with members of the PPUK (Person, Practice, Development and Culture) group, including colleagues from Arhus University. Nick now has a long list of ideas and questions to work through in coming analyses and publications! We have nearly met our recruitment target for phase two. We now have 13 families involved, and will be tracking their stories over the coming months. We are waiting until May to recruit the final few families, so that we get the best spread of services and sites involved. We’ve already captured some very powerful accounts of positive change, and our job will be to see if the changes last, help families develop resilience, and if so, what it is that makes this happen. Teena and I have also had a paper accepted in Pedagogy, Culture and Society. This is the second paper to come out of the project, and the first to report empirical findings. It presents outcomes from phase 1, and more details will follow here in the newsroom and in the main project page, as soon as the paper is published. Fieldwork continues apace. We have broadened the sample further, recruiting participants from outreach (home visiting), day stay, Circle of Security, and specialist toddler services (in addition to more from parenting groups, too). We have begun interviewing both parents and professionals about the benefits of these services. This provides us with detailed insights during or immediately after parents’ contact with particular services. It will also provide a benchmark for comparison when we do follow-up interviews in a few months’ time. To date we have 12 parents participating in phase 2 (and the professionals working with them are participating too). This is close to our recruitment target of 15, which we hope to reach in April or May. Meanwhile we have submitted a paper, co-authored with practitioner representatives from the three local health districts working with us at this time. Things are moving fast again. We have begun Phase 2 fieldwork, kicking off by attending an innovative Early Parenting Group, and recruiting parents so we can track how the group supports them over time, and hopefully explore how the positive benefits outlive their contact with the group itself. The project has also been featured in the Australian Association for Research in Education blog, EduResearch Matters. Also published this month is a contribution to the OECD Observatory of Public Sector Innovation, about effective partnership work between professionals and parents (based on previous research at Karitane’s Residential Unit, but closely related to the #CreatingBetterFutures project,, and an indication of the kind of public engagement that we hope will come out of the new research). The project is a year old already! This month we took stock of the achievements in 2015 and wrote an End of Year Report. This was sent to the members of our Expert Reference Group (comprising stakeholders from participating organisations), and to research administrators at UTS. We checked that we had spent the budget as planned, and achieved the relevant milestones. Looking forward to 2016, we have been contacting people from a range of services to seek consent to recruit participants for phase 2. The focus in phase 2 will be on tracking long-term positive change in families. Particularly we want to trace how impacts or changes in families outlive their contact with a particular service. Purpose: This conceptual article aims to shed new light on how partnership practices that build resilience in families work. Two broad questions are explored: (1) What are the forms of expertise required in practices that effectively build resilience through partnership?, and (2) How can some of the challenges practitioners experience when working in partnership be addressed?. Approach: A theoretical approach is taken, framing partnership as collaborative knowledge work between practitioners and clients. Concepts of relational expertise, common knowledge, and relational agency, are explored as means to understand the forms of expertise involved in partnership. An empirical example is provided from practices guided by The Family Partnership Model, an approach that has been widely implemented. Findings: These concepts help to address three key challenges experienced by practitioners: client readiness for change, maintaining focus and purpose, and using specialist expertise in partnership. This approach elucidates features of partnership practice that distinguish it from expert-led models, while highlighting diverse forms of expertise in play. Originality/value: The framework presented in this paper is distinctive and can be used to identify how practitioners can avoid common dilemmas, even in challenging circumstances with vulnerable families where practitioner-client relationships may be perceived as fragile. It counters the idea that partnership work dilutes professional expertise. Instead, an enriched and augmented view of professional expertise is presented. A big month (again)! Now, after many hours of analysis across all our data, having sufficient confidence our early analytical outcomes, we began a series of Research Roadshows, engaging with practitioners and managers in each of the three org anisations involved in phase 1 fieldwork. Some of these sessions involving working closely with small groups, others were conducted as part of larger development days for staff. On 27th November, I presented a keynote talk at the Tresillian Conference ‘Educating Today’s Parents’, which was attended by 250 child and family health practitioners. All three of our Sydney-based research partners were represented, but there were professionals from a wide range of other organisations and services there too. Significant analytical progress over the past few weeks, including a few major breakthroughs! The sequence of insights began in Gothenburg. With Åsa Mäkitalo and colleagues, we looked at a transcript of day stay visit that I’d picked out as a particularly effective example of partnership. There, the idea of looking for different social contracts between the professional and parent came up. The following week, I’d put that idea to work on that transcript, and took the emerging ideas to Madeleine Abrandt Dahlgren and colleagues at Linköping University (also in Sweden). In another collaborative analysis session, we came up with a metaphor that describes the contracts in terms of a parent arriving with a ‘ball’ (the ball stands in metaphorically for the problem facing the family). The contracts involved: (1) show me the ball; (2) let me (professional) help you see the ball in a different way; (3) let me join you in holding up the ball; and (4) the parent leaving, now holding a ball that looks different and feels lighter. To find out what these really mean you’re going to have to wait to se our publications or publicly released practitioner tools! But if you can’t wait, just contact me and I’ll be happy to share! In fact we will be doing just that in late October and November as we begin a cycle of Research Roadshows, visiting the sites where we did fieldwork, and providing initial feedback to practitioners. The result of overseas collaboration, and then many hours testing new ideas against all our data, and refining them. The next breakthrough came very near the end of a long slog through all the data we’ve collected so far. The contracts idea provided the starting point, and by looking at all 52 of the visits we had observed, we have refined the concepts significantly. We are now thinking about them in a more sophisticated way, in terms of four kinds of partnership activities, that have different formations (expressed in terms of how a subject works in a mediated way on an object), and different social contracts (in which professional and client responsibilities vary). This is SO exciting, and will pave the way to further analysis of the role of professional expertise, how to build resilience in vulnerable families, and cultural historical concepts such as the space of reasons, double stimulation, D-analysis, and zone of proximal development. The project was also featured in the UTS School of Education monthly newsletter ‘Education Research Insights’. Phase 1 fieldwork complete! We had a target of observing 50 interactions (either home visits or day stays), and passed it early this month. Here are some Phase 1 statistics. These were based in 5 different sites – covering 5 different areas of Sydney. These were provided by three different organisations: Karitane, Tresillian, and Northern Sydney Local Health District. 43 different families were involved, with a total of 50 parents and carers participating. We saw some families once, but others we were able to follow through multiple interactions, including some who crossed over from one service to another. Now our job is to analyse the mountains of rich data that have been produced. And I’m spending some time with colleagues in the University of Gothenburg and the University of Linkoping this month doing exactly that – getting insights and ideas from other experts. Another huge month – this time almost exclusively focused on fieldwork. Our target is to observe 50 visits (either by parents to day stay, or practitioners to parents’ homes) and by the end of the month we had clocked up over 40. Importantly, there have been occasions when practitioners or clients have opted out, which shows us our ethics processes are working well. Another milestone, too, in the submission of a paper that refers to my previous work at Karitane, using it to develop a conceptual framework that will form the basis for some of our analysis in the current project. An amazing month for our project. Fieldwork continues and accelerates, and we have both shadowed different practitioners in a range of kinds of services. Already we have incredibly rich data and have seen some remarkable ways in which their multiple forms of expertise are being put to use to make a difference for families. We are also delighted to report that the CBF project has been featured in the Sydney Morning Herald, and in Brink. The same article also appeared in the Brisbane Times and Medical Express. We have data! Perhaps the most significant milestone yet! We have been able to present briefings to potential participants in several services, and through these to recruit practitioner participants. After that, families have been recruited (using an “arm’s length” approach as per the ethics guidelines), and we now have our first few bits of observational data. On initial reading, it looks incredibly rich and speaks volumes to the concepts we are interested in (pedagogy, everyday and scientific concepts, space of reasons etc). A sign that our ethics procedures are working well is that one service (a sub-part of one of the three collaborating organisations), and a number of individuals have declined to participate. This is important to us as an indicator that both at individual and service levels, people feel able to say ‘no’. Nick made a visit to the Centre for Parent and Child Support (London, global home of the Family Partnership Model) and to the University of Oxford’s OSAT group (Oxford Centre for Sociocultural and Activity Theory Research). 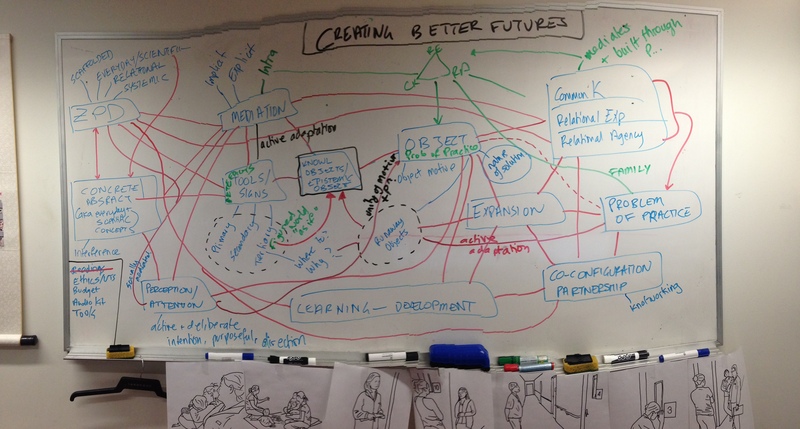 This helped us leap forward in some of our conceptual work. In particular now we are looking at Jan Derry’s work on the ‘space of reasons’ (how conditions are created in which practitioners and clients are able to ask, and explain “why…”), and also at different kinds of change (spontaneous, planned and guided change). The latter aligns #CreatingBetterFutures with the very latest developments in the Family Partnership Model. Month 4 and more milestones! The many different approvals and authorisations for the project are now all in place. This includes the NEAF (national ethics approval), Site Specific Authorisations from the three participating Local Health Districts, ratification by UTS, and the necessary fieldwork risk assessment, medical forms, working with children checks, and (for me) four visits to the doctor for a TB screening!. The submitted paperwork totalled over 700 pages, and I can count nearly 200 emails to various people in the research, ethics, and governance offices who have helped navigate the varying bureaucracies. It has all gone smoothly as a result of the support we received from these people (too numerous to be named). Now we have the authorisations in place, we are delighted to name our three research partners for Phase 1. These are (in no particular order): Karitane (part of South Western Sydney Local Health District), Tresillian (part of Sydney Local Health District), and the Northern Sydney Local Health District. We can now start the process of approaching practitioners in these three places to see if they would like to be involved in the first phase of fieldwork. Teena and I have been continuing our conceptual work too, recently looking at Middleton’s ‘D-analysis’* as a potentially useful way in which we could trace how learning happens, and its significance, through sequence and consequence in communication between professionals and parents. The picture shows Teena and I worked at our whiteboard in order to make sense of the D-concepts and how they might apply in our work! *Middleton, D. (2010). Identifying learning in interprofessional discourse: the development of an analytic protocol. In H. Daniels, A. Edwards, Y. Engeström, T. Gallagher & S. Ludvigsen (Eds. ), Activity theory in practice: promoting learning across boundaries and agencies (pp. 90-104). London: Routledge. A busy month! Ethics approval was received for the project overall, and we got Site Specific Authorisation for one of our three research sites – meaning we are good to go ahead and start recruiting participants and begin Phase 1 fieldwork. Meanwhile, our conceptual framework building is racing ahead, still exploring potentially relevant corners of Cultural Historical Activity Theory (CHAT) – particularly ideas about co-configuration and agency – and also wider literature on resilience. Nick completed writing of a major monograph (Professional Practice and Learning: Times, Spaces, Bodies, Things) and submitted it to Springer Press. 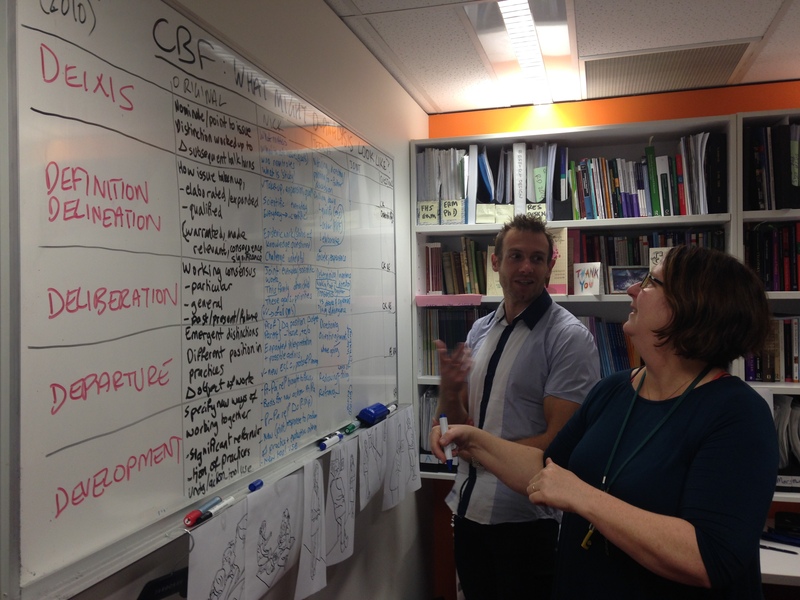 While this reports outcomes of his prior project with Karitane, it lays some crucial conceptual groundwork for the #CreatingBetterFutures project – including ideas of pedagogies of the unknown and nanopedagogies. Month 3 kicked off with a great meeting of people across Australia working with the Family Partnership Model (FPM) – with none other than Crispin Day (from the CPCS) in attendance. Practitioners from all Australian States were there to discuss recent developments in the FPM. The meeting was held in the Royal Children’s Hospital in Melbourne. We received the initial response to our NEAF (ethics) application: no major questions were raised, and no significant changes are required. We have a few points to clarify, and fingers crossed should be on course to receive approval within a few weeks. After this we can go ahead with Site Specific Authorisations, ratification by UTS – and then we can actually begin recruiting participants and get stuck into fieldwork! This has been a great month for conceptual work – Teena and I have been going back through Vygotsky’s original works (Mind in Society, Thought and Language), and reading lots of Anne Edward’s work on relational agency. 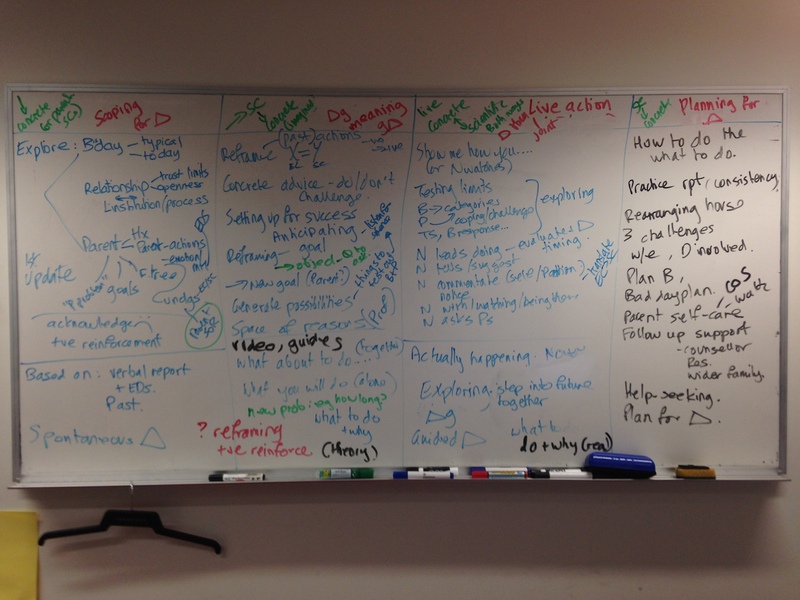 Here are a couple of pictures of the whiteboard in my office – the result of discussions about our readings. The first is from 10 March – mainly about everyday and scientific concepts, the zpd, and mediation, and the second from 31 March – trying to pull lots of concepts together! It’s only month 2 and already it feels incredibly busy! We are delighted to have two firm partners on board with us – Karitane and Tresillian – and are excited to be in negotiations with a third site here in Sydney. These collaborations will be formalised by seeking Site Specific Authorisations (SSAs) through the relevant Local Health Districts. Once we have all these in place, we are hoping to do a media release through UTS, to acknowledge the support and commitment from our stakeholders. Our major milestone this month has been to get the main ethics approval form submitted – a mammoth document involving 8 different versions of a Participant Information Sheet (for good reasons), and lots of careful thinking through risks and benefits to participants. Because our study will involve child and family health services, the approval goes through a NEAF (National Ethics Application Form) process, and will then be ratified by UTS’s HREC (Human Research Ethics Committee). Meanwhile, Teena and I have begun a program of reading and building our conceptual framework in more detail. Month 1: The project comes to life less than two months after notification from the ARC! To even get this far I’ve worked with UTS to get an account set up for the project, and appoint a Research Associate (Teena Clerke). So there is lots of logistical and contracting work that has gone on in the background. Now our focus is on approaching potential project partners so that we can submit our ethics application.